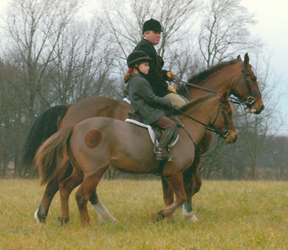 “Independent and responsible, competitive but realistic” are words used to describe the 2010 Jonathan Kiser Memorial Scholarship winner Emma Warden by her mom Marjorie Warden, as well as many others in the foxhunting and steeplechase communities. When talking with Emma herself, one can feel in her voice the excitement and passion about racing. Growing up in the saddle, Emma has always considered the fields of the Green Spring Valley her home. “I took a few riding lessons in a ring when I was in first grade but the ring has never been the place for me. I absolutely hated it!” she explained. For those who find the ring a bit boring or claustrophobic, there are a few other equestrian endeavors one could try, but none, according to this young jump jockey, are as thrilling as racing across the countryside over timber. 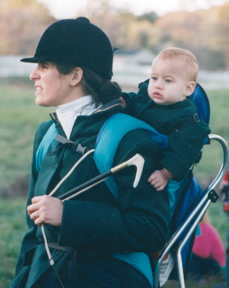 Like many others who find their way onto the steeplechase racecourse, Emma got her equestrian start as a foxhunter, riding alongside her parents John and Marjorie with the Green Spring Valley Hounds “before I could even walk.” And she credits them the most with influencing her riding over the years. Marjorie remembered those early years when she would take Emma out beagling in a backpack and then buying her first pony while she was still an infant. “We found the perfect pony, Cherry [bought from Billy Streaker], and took her out driving. Emma did her first horse show at the Howard County Fair when she was 18 months old and took second in an off leadline class; that pony would follow me anywhere,” she remarked. After some slight nudging from North American Point-to-Point president and NSA trainer Regina Welsh and watching other kids race, Emma entered her first pony race aboard her hunt pony Rootbeer. “He was such a great pony. You just pointed him at a jump and he’d go,” she said. “As soon as I finished that first race, I wanted to do it again and again and again,” she enthused. 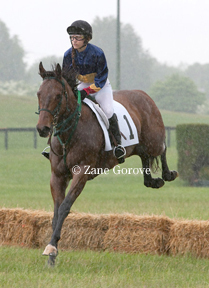 The consistency she and Rootbeer achieved in 2004 (two firsts, three seconds and one third) earned her the title of not only top Maryland Steeplechase Association Medium Pony Rider but also MSA Overall Pony Rider of the Year. “Emma learned the lesson of dedication and consistency,” she won year-end awards because she got out and rode in every race,” John said. From 2004 through 2007, Emma and Rootbeer rose through the ranks and began winning races. Although Rootbeer was a great jumper, Emma admits he wasn’t very fast and at the North American Point-to-Point Association (NAPPA) championships each year, she only finished second or third. In 2005, Emma had some success with another family pony, Black, with whom she won the Pony Races for Juniors at Marlborough. The following year, she and Black won three times, mostly in the pony and junior flat races. Pepper was added to her pony string in 2008 but still, a first place at the NAPPA championships eluded her until she found Emmy-Lou. 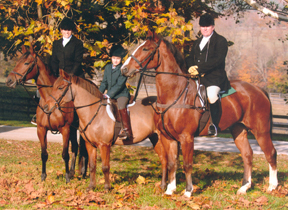 That pair raced twice in 2008 and won both their outings, first in the Junior Ponies at Potomac, and then finally, a win at the NAPPA championships in the Junior Field Masters Choice-Ponies division. 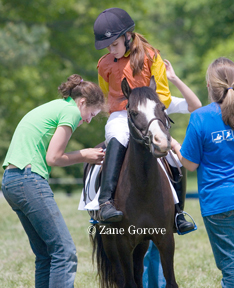 Emma’s success with the ponies earned her the MSA Overall Pony Rider of the Year for three consecutive years (2004 through 2006). She was also the MSA Small Pony Rider Champion in 2006 and Medium Pony Rider Champion in 2004. In 2009, Emma made the switch to racing horses with Scott’s Gold, but still found time to dominate the large pony division aboard Pepper. With Scott’s Gold, Emma raced to second place in the NAPPA championships Junior Field Masters Chase-Horses. Emma tags along with mom Marjorie out beagling. Then, during the 2010 season, Emma’s racing experience took a huge leap forward while she raced two horses; Cleo and Watch The Phone. “Cleo is my mom’s mare and she’s a joy to ride. Point and shoot,” she said. Watch The Phone (aka Edward) was a three-year-old off-the-track Thoroughbred who had just completed his first season of hunting. “I was kind of nervous going into that first race. He saw the flags and the silks and just got very excited,” Emma remembered. Green Spring Valley was memorable for sure, but for all the wrong reasons. After having some trouble at the start, Edward and Emma crashed into the first fence and Emma left with a mild concussion but also with the drive to get back on. “I wanted to fix the problem and teach him how to be a steeplechase horse,” she said. Emma remarked that her family has very rarely sent horses out for training and that they all pride themselves in starting their own horses and bringing them along. “It became my goal to teach him, and then we won at the NAPPA championships!” she said. The road to get there, however, was a bit bumpy, but this young race rider mustered all her determination to end the season on a great note. “I think that racing has given her a better appreciation of what her ponies and horses can do,” Marjorie commented. “Emma was always a quiet child, but racing has given her confidence,” added John. 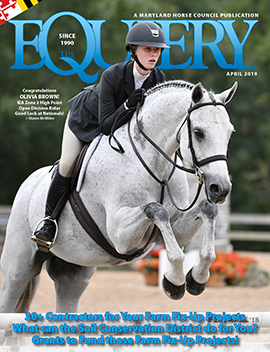 After falling at Green Spring Valley, Emma switched to racing Cleo, winning at Elkridge-Harford (which was mom’s favorite memory of the 2010 season) and the Maryland Junior Hunt Cup, while she worked with Edward at home. Then, at his first race back, at Howard County-Iron Bridge, all Emma’s hard work prevailed as the horse jumped around like an old pro to win the Junior Field Masters Chase-Horses race. “That win was the best moment of last season,” Emma stated. “Each jump he got more confident and he finished amazingly! He wanted to race, he wanted to win and he knew exactly what to do,” she added. Emma went on to say how proud she was of Edward and also how much she enjoyed standing in the winner’s circle as the owner, trainer and rider of a horse she developed on her own. “That’s what it’s all about,” she said. Also at the NAPPA championships that year, Emma and Cleo placed second in the Senior Field Masters Chase. Emma believes that it was her efforts with Edward, though, that earned her the Kiser scholarship. As part of the scholarship, the winner gets a chance to spend a week at Tom Voss’s Atlanta Hall Farm in Monkton and attend the NAPPA Steeplechase Camp free of charge. “There is so much to say!” Emma remarked about her stay at Atlanta Hall Farm. “All of the training riders there are great to be around. Tom just knows so much about the sport. He has a great eye and gave me lots of tips on how to improve my riding. I’m just so impressed by him,” she added. During the camp, Emma and the other steeplechase campers traveled up and down the East Coast visiting the top steeplechase barns and tracks. The most memorable part of the trip for Emma (“besides the incredibly long trip home drinking lots of coffee”) was getting to ride out with jump jockey Jody Petty at the Hendrick’s Greenlawn Stables in Coatesville, Pennsylvania. “He is just such a laid-back guy and has a fantastic view on life,” she said. “Laid-back” is actually what Emma took away most from her time at camp and with Tom. “It was nice to see how stress-free some of the big barns were,” she stated. Beyond the Racecourse Laid-back and taking it easy is how Emma sees her 2011 race season going. “I’m really relaxed about it and don’t have a set plan. I’ll just see how fit Edward is and see if I can get rides on anyone else’s horses. I’m going to call some of the local trainers and just say ‘hey, if you’re looking for a rider, I’m here!’” she said. Outside of riding, Emma is a field hockey goalie for the varsity team at the McDonogh School, and has been for the past two years. “I want to focus this year on field hockey and school work,” she said, adding that she hopes to get a field hockey scholarship to a college in the Mid-Atlantic area. “I absolutely love Maryland and want to stay close to home,” she said about her college search. She went on to say that she wants to be able to actually play on a field hockey team as a freshman and not just sit the bench. This has become a goal that she’s determined to find a way to fulfill. “All the facility and staff and students at McDonogh have always inspired me to be the best I can be. I know it sounds silly but I want to live up to the ‘McDonogh standard’ in all I do,” she said. “Horseback riding has always been a huge part of my life, and I know it will always be, but I don’t really see myself as being known as a steeplechase jockey only,” she commented about her long-term riding goals. Although she may not see herself pursuing the goal of being a professional jump jockey, Emma is still always passionate about the sport and getting more and more people involved. “I want as many people as possible to give it a try and grow up with racing as part of their lives!” she said.